This is huge, literally! 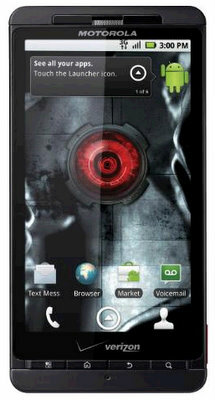 The Motorola Droid X with it’s 4.3 inch touch screen display is fixin’ to hit Verizon stores tomorrow like a tidal wave. Unlike the Droid Incredible release that has plagued Verizon with supply shortages, Verizon doesn’t plan on making the same mistake with the Motorola Droid X. In fact, it’s been said that is you order a Droid Incredible today, you won’t receive it until this time next month. The Droid X will be powered by the Android 2.1 OS with an update to Android 2.2 and Adobe Flash Player 10.1 coming via an over-the-air update later this summer, according to Mashable. So who’s planning on showing up tomorrow at Verizon to pick up the huge Motorola Droid X?